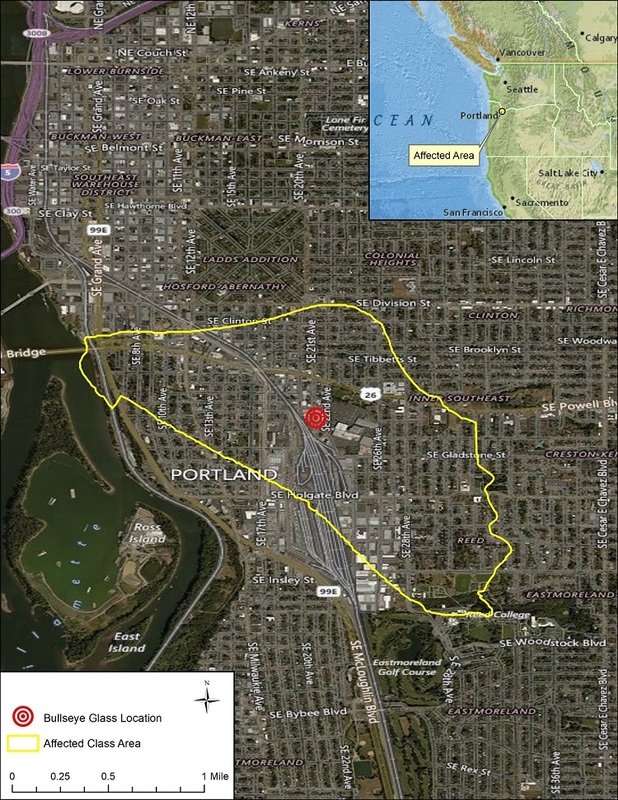 · Ten residents of Southeast Portland—the “Plaintiffs”—sued Bullseye Glass Co. (“Bullseye”), alleging that certain heavy metal emissions from Bullseye’s production processes contaminated the air in their neighborhood and their properties. Plaintiffs and Bullseye have reached a Class Action Settlement (or “Settlement”). Your legal rights are affected whether you act or not. Please read this notice carefully. · The Settlement guarantees Bullseye will use and maintain approved filters on all its glass-making furnaces, and it creates a $6.5 million Settlement Fund. After Court-approved costs and fees, the remainder of the fund will be used to pay for a $1 million neighborhood air monitoring program, reimbursement of air emissions-related expenses, and payments to people covered by the Settlement, called “Class Members”. · You may be a Class Member covered by the Settlement if you were a resident or owner of the residential properties included in the class area shown on the map below on February 3, 2016. · As a Class Member, you will benefit from the furnace filtering and air monitoring program provided by the Settlement, and you may also be entitled to compensation from the Settlement. The terms of the Class Action Settlement are described below. Filing a claim will allow you to receive money under the Settlement if you’re eligible. By doing nothing, you will not obtain any payment from the Settlement, but you will give up legal rights to sue Bullseye. Get out of this lawsuit. Get no monetary benefits from it. Keep your rights. If you do not wish to be excluded from the Class but you object to the terms of the Class Action Settlement, you may write to the Court about why you don’t like the Settlement. To view a larger version of this map, please click HERE. Law Office of Karl G. Anuta, P.C.